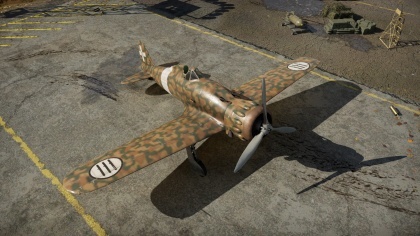 The C.200 Saetta serie 3 is a Rank I Italian fighter with a battle rating of 1.7 (AB/RB) and 2.0 (SB). It was introduced in Update 1.69 "Regia Aeronautica", but a variant existed in the German tech tree prior to the update. The M.C 200 is a fairly typical pre-war Italian design, Moderate speed combined with good rates of turning, and high speed tolerance, while maintaining good controls at all speeds. Furthermore, the MC 200 is a capable climber, easily matching a lot of planes that it will regularly meet in its BR range. Further its fairly though, capable of taking hits and return to the airfield for repairs. However it does have its issues as well, most notably the poor engine power which results in poor acceleration and, much like all Italian designs, it suffers from poor armament as well, although given the lower BR then the Folgore, this is less of an issue. Furthermore, as of 1.55, its payload is not modeled, so it doesn't carry bombs, meaning its a poor ground attacker. Being only able to harm soft Ground targets. For the guns, the same applies to all other Italian aircraft, generally you want to use Tracers, Anti-air or Stealth since they are the belts that deal the most damage. They suffer above 300 meters, so fire only at or below that range for best effects. Furthermore, much like the other Italian fighters the armament is woefully inadequate to deal with bombers, hence it is best to avoid them entirely, or focus on taking out the engines. Only exception are the very early biplane bombers, such as Swordfish, Po-2 and the like. 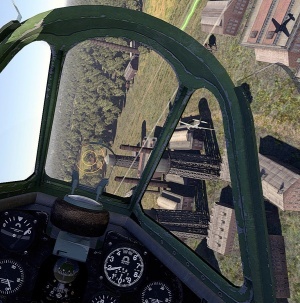 M.C.200 vs P-36C Hawk over industrial zone in Ruhr. Its recommended to climb as much as you can before engaging, a good 4,000 meters is important, for it can be used to get some extra speed when you need it. For Combat, it can engage in a wide array of moves, the decent energy retention and high speeds it can attain, about 800 kph, before it begins to red-line, means it can be used for Boom & Zoom, or to get away. 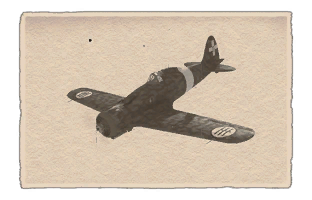 Furthermore its a good turn-fighter, it out-turns a lot of planes it faces, exception being biplanes and, if you are in arcade, Japanese aircraft. However take care, the engine isn't the most powerful, and accelerating is problematic, so its important to watch your speed carefully in combat. This becomes especially important since the engine is also quite prone to overheat when WEP is engaged, and it cools down slowly. The Guns aren't exceptional, low rate of fire and ineffective above 300 meters. Its speed in level flight is nothing exceptional. The M.C.200 is a pre-war Italian monoplane manufactured by the Macchi aircraft company, its name is derived from its chief designer, Castoldi, designer of the famous M.C.72 racing plane. The M.C.200 was a design put forward for the Regia Aeronautica's Series 0 tender set in 1934, a specification for a modern mono-wing interceptor. of the Italian aeronautical industry three firms submitted a prototype, the G.50 by Fiat, the Re 2000 by Reggiane and the M.C 200 by Macchi. Of the Three designs, the M.C 200 won the tender, being the fastest and the best aircraft, although it did have issues that needed fixing before it could enter service, most notable its issues with auto-rotation and sudden, violent stalls. For this reason, the Fiat G.50, while inferior to the M.C 200, was chosen for production as well, as it would be able to enter service on short notice, the G.50 went on and served in the Spanish civil war, and for a time, along side the M.C.200. This page was last edited on 12 January 2019, at 17:35.